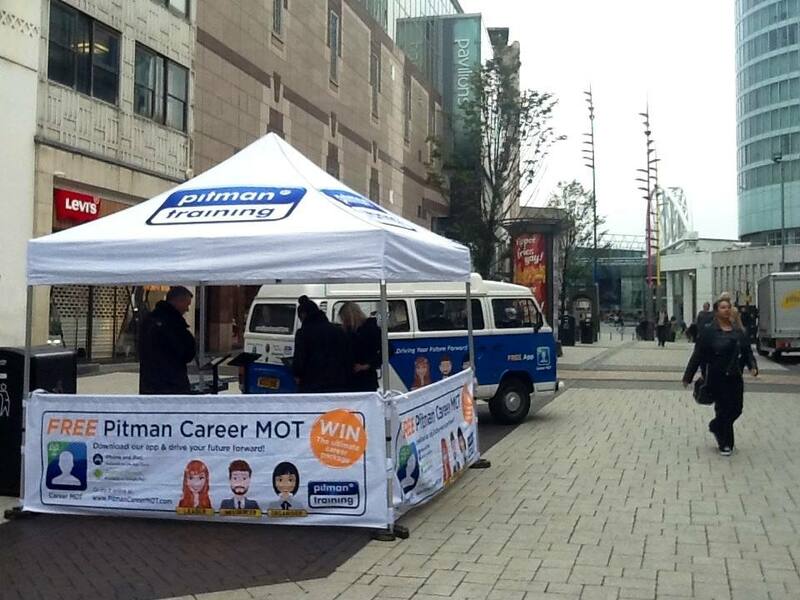 We set up our Pit-stops on Birmingham’s High Street, just next to the Bullring Shopping centre, ready for another day of Career MOT Testing. 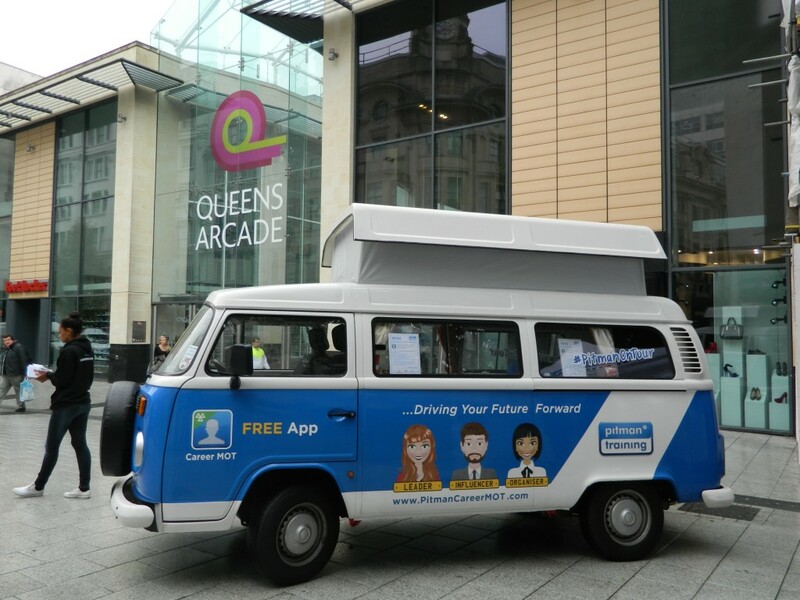 We were very pleasantly greeted with a multitude of eager faces, happy to try our new free app ‘Career MOT’ and book some free career and CV advice. It was really great to see so many people inspired to drive their futures forward. Looking forward to another busy day tomorrow! Day 10: Is Cardiff a City of Executives? We’ve enjoyed another busy day at our Cardiff Pit-stop on Queen Street… so far we’ve gathered some quite remarkable stats which would suggest that Cardiff could be a City home to many an ENTJ – Extroverted iNtuitive Thinking Judging profile: which could lead to career paths including an MD, Politician, Marketing Manager or Entrepreneur amongst many others. Day 4: We all Break-down sometimes! After a successful couple of days on the road in Edinburgh, we hit a minor speed-bump in our tour and broke-down, just outside of Morpeth! This got us thinking… how many times a year we hit minor speed bumps in our careers, and temporarily break-down. Luckily for most of us, this is nothing more than a temporary glitch, a bad day at most. However, shocking recent statistics have shown that at least 27% in employment often or always feel depressed, with 48% of those not in education, employment or training feeling this way. 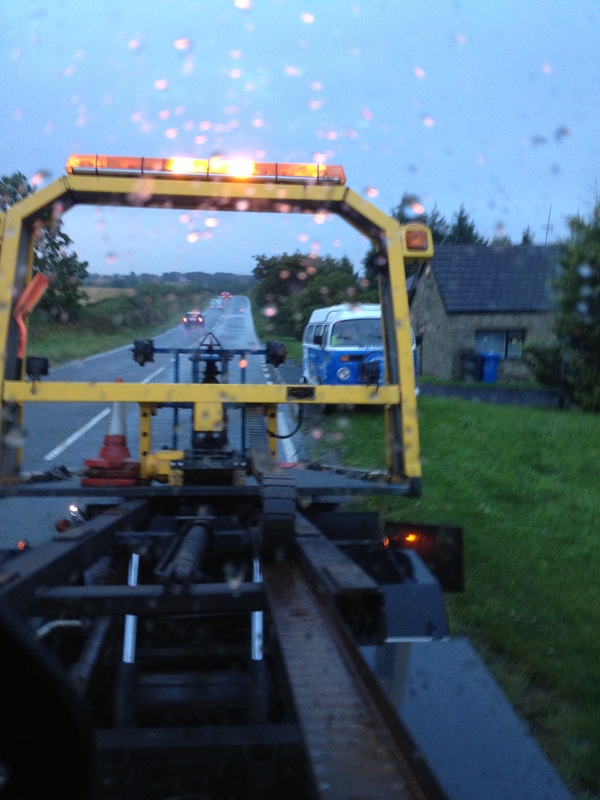 The reality is, much like the temporarily sad fate of our campervan, there is help, motivation and support out there for those that need it, through a combination of advisory sessions, training and employer reviews. Luckily for us, we managed to tow our way to the next pit-stop, with a bit of perseverance and determination! 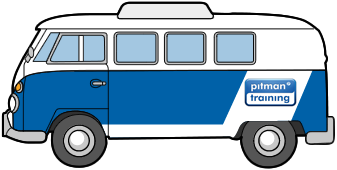 We’ll be putting our camper in for repair and have a temporary replacement until he’s fixed, but will make sure we make it to all of our Pit-stops, one way or another! On this occasion, it would seem ‘MOT’ is one pun too far! Day 3: Is Edinburgh a City for Dreamers & Idealists? 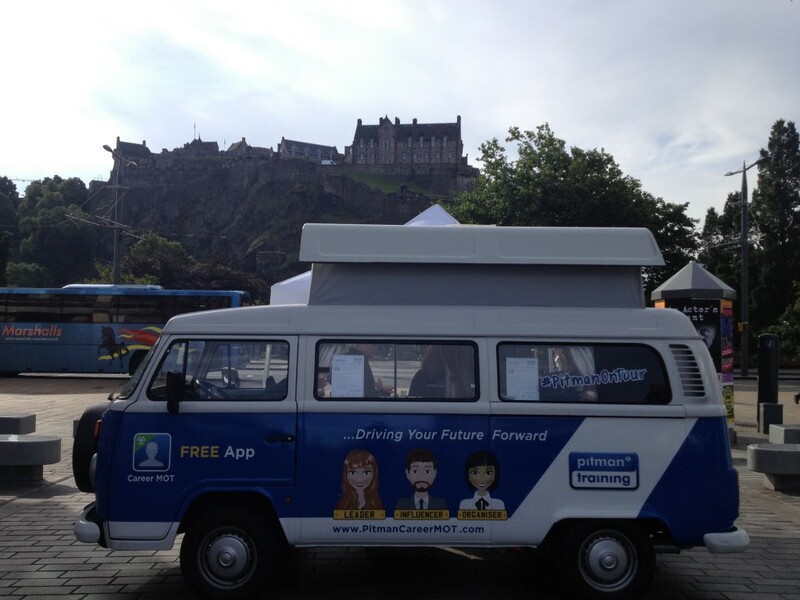 We spent day 3 of #PitmanOnTour back on Castle Street, Edinburgh with a flurry of shoppers, and local workers, debating career paths and progression. Interestingly, we are already seeing a regional trend in profile characteristics, with a majority pull towards ‘INFP’ – the result for Dreamers and Idealists. Not as fluffy as the title may suggest, this category suits those who would like to/work in roles such as: teacher, editor, writer, counsellor, report or musician, amongst many others. We’re looking forward to seeing the outcomes in other regions over the duration of the campaign, and hope we help many make some big career steps and decisions to drive their future forward. 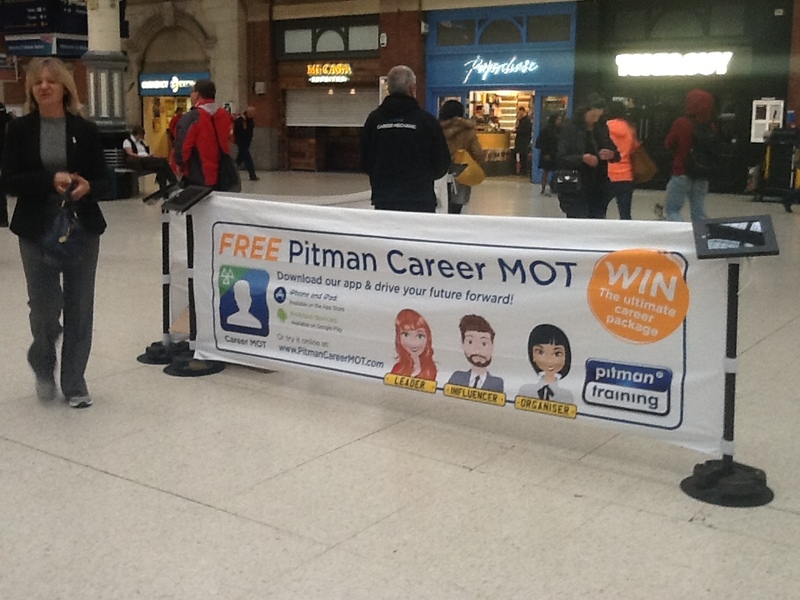 Local shoppers, commuters and workers alike have spent today trialling our new free app at the first Pitman Training Career MOT Pit-stop based on Castle Street, Edinburgh. Many were surprised at just how close our diagnostic profiling station had matched them not just to their characteristics, but their career paths or aspirational goals! We managed to point a healthy number of onlookers in the direction of their next attainable career move, which left us with a skip in our step – looking forward to covering the length and breath of the UK. We’ll be back to conduct more diagnostic profiling tomorrow morning (5th September) – if you missed us today, be sure to pass by!